Four years after the magnitude 7.2 earthquake, Bohol has better bridges and roads now. The status report submitted by the DPWH 1st Engineering Office to the provincial government in time of the 4th anniversary of the Great Bohol Earthquake included the completion of 37 road projects, five national bridges, and three retrofitting of bridges. The 37 road projects had been allocated P761,478 million, while the allocation for the five national bridges completed reached P222,545 million, and 3 retrofitting of bridges had cost P1.612 million. DPWH 1st District Engineering Office also completed the installation of four single-lane modular steel bridges amounting P12.97 million and had constructed two bunkhouses and services facilities in Loon and Tubigon in the amount of P17.45 million. Out of 37 bridges, five bridges collapsed and had been damaged by the magnitude 7.2 earthquake. Also damaged and repaired are the portions of the national highway at Tagbilaran North Road K0017+210, Tagbilaran North Road K0031+100, Tagbilaran North Road K0011+950, and Tagbilaran North Road K00015+080. The damaged bridges included Abatan Bridge in Maribojoc, Moalong Bridge in Loon, Tultugan Bridge and Desamparados Bridge in Calape, and Tagbuane Bridge in Alburquerque. After a month, emergency or temporary bridges had been constructed and roads that were rendered impassable then were rehabilitated. DPWH First District Engineering Office installed the 117.57-meter Abatan Emergency Steel bridge with a project cost of P3.84 million for labor only. The labor cost for the installation of the 71.268-meter Moalong Temporary Steel Bridge amounted to P2.54 million. The labor cost for the 36.576-meter Tultugan temporary steel bridge reached P2.51 million. The 39.624-meter Tagbuane emergency steel bridge had the project cost of P24.04 million. At present, DPWH First District Engineering Office attends to the ongoing construction of the New Abatan Bridge in Maribojoc, a double lane bridge with sidewalk and length of 97.20 meters. The total project cost of New Abatan Bridge reached P74.55 million. 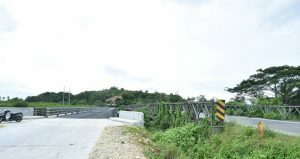 DPWH First District Engineering Office had already completed the Moalong Bridge in Loon with double lane and sidewalk, length of 22.80 meters and total project cost of P64.93 million. Also passable now are the newly completed 18.5-meter Tultugan Bridge in Calape which is double lane with a sidewalk in the amount of P30.58 million; the 22.8-meter Desamparados Bridge in Calape- -also double lane with sidewalk at P26.98 million; the Tagbuane Steel Bridge; and the Mandaug Bridge in Calape. Also among the projects undertaken by DPWH with DAR are the single-lane modular steel bridges which include the Borja Bridge and Bacsanan Bridge in Catigbian, the Mag-aso Bridge and Rizal Bridge in Antequera. Borja Bridge has a length of 21.336 meters and was constructed with the budget of P4.46 million. The 21.336-meter Bacsanan Bridge had been allocated P4.21 million. The construction of the 27.432-meter Mag-aso Bridge cost P2.12 million. An amount of P2.18 million had been spent on the construction of the 27.432-meter Rizal Bridge. The rehabilitation of the Junction Tagbilaran North Road to SIP Cortes at the K0009+754-K0010+242 point amounted to P28.25 million.